The total cost of this contract was increased by $769,999.99 from $70,000.00 to $839,999.99. RESEARCH TITLE: Chemical Casualty Care: Wound Dressings Designed to Speed Wound Closure Following Debridement of Cutaneous Vesicant Injuries. TERM OF CONTRACT: Phase I - November 14, 2005 - October 13, 2006 (Research ends May 13, 2005 for base period). The additional 5 months are to allow 1 month for submission of final report and 4 months to allow for Phase II determination. Phase II may or may not be awarded. Phase II - February14, 2007 - March 13, 2009 (Research ends February 13, 2009). The additional month is to allow for submission of final report. The CLIN extended description has changed from The contractor shall furnish the necessary equipment, personnel, facilities and supplies to conduct the SBIR Phase I research objectives in accordance with the Contract Schedule and the contractor's proposal No. A052-131-1765 Topic A05-131, pages 12-16, wich are incorporated herin by reference. See Section G for payment instructions. to The contractor shall furnish the necessary equipment, personnel, facilities and supplies to conduct the SBIR Phase II research objectives in accordance with the Contract Schedule and the contractor's proposal No. A2-2682, Topic A05-131, is incorporated herin by reference. See Section G for payment instructions. Period of Performance 14 September 2006 - 13 February 2007 (Research end 13 January 2007). The option status has changed from Option to Option Exercised. THIS LOCAL CLAUSE IS TO BE INSERTED INTO ALL ARMY OR CBD SBIR or STTR PHASE II AWARDS AT THE TIME THAT THE MODIFICATION, EFFECTING PHASE II, IS ISSUED. THIS LOCAL CLAUSE DOES NOT APPLY TO OSD PHASE II AWARDS. THIS CLAUSE WILL BE IN ADDITION TO THE LOCAL CLAUSE 52.035-4038 REPORTING REQUIREMENTS (WHERE YOU ARE TO INCLUDE MONTHLY, QUARTERLY, AND ANNUAL/FINAL REPORTING REQUIREMENTS FOR ALL PHASE II SBIR or STTR AWARDS). The contractor shall submit a final, publicly releasable SBIR/STTR Phase II R&D Project Summary at the end of the contract. The summary shall be an unclassified, non-sensitive, and non-proprietary summation of results that is intended for public viewing on the Army SBIR / STTR Small Business Portal. The project summary shall address the data requirements, described below, on a summary basis and shall not exceed 800 words. The summary shall be submitted electronically and shall be in HTML format. Since the Department of Defense (DOD) will be publishing the summary, this project summary shall not contain any proprietary, classified, or International Traffic in Arms Regulations (ITAR) restricted data. The R&D Project Summary shall report key project administrative, programmatic, and technical data, to include administrative and research objectives, innovative approaches, accomplishments, plans, technology transitions, technology transfers, and issues. The technical data contained in the R&D Project Summary will enable a comprehensive assessment of project goals, progress and status. The format and content preparation instructions outlined below shall be used for the data product, generated by specific and discrete task requirements as delineated in the contract statement of work (SOW). 1.1.1. Subcontractors. Verify each subcontractor. 1.1.2.1. Principal Investigator(s) Contact. Verify the name, organization, business address, business phone, business fax, and e-mail address of each principal investigator. 1.1.2.2. Administrative Contact. Verify the name, organization, business address, business phone, business fax, and e-mail address of the administrative point of contact. 1.1.2.4. Programmatic/Technical Reporter Contact. If the Principal Investigator is not the reporter of the programmatic/technical data verify the name, organization, business address, business phone, business fax, and e-mail address of the programmatic/technical reporter point of contact. 1.2.1. Project Uniform Resource Locator (URL). Provide the project URL. 1.2.2.2. Problem Description. Provide a concise description of the problem area addressed by this research project. 1.2.2.2.1. Research Goals. Identify specific research goals of this project. Identify and quantify expected performance improvements from this research. Identify new capabilities enabled by this research. Identify and discuss salient features and capabilities of developmental hardware and software prototypes. 1.2.2.2.2. Expected Impact. Describe the expected impact of the research project, if successful, to the problem area. 1.2.2.3.1. Detailed Description of Technical Approach. Provide a detailed description of the technical approach that was used in this project to achieve the research goals. Specifically identify and discuss innovative aspects of the technical approach. 1.2.2.3.2. Comparison with Current Technology. Describe state-of-the-art approaches and the limitations within the context of the problem area addressed by this research. 1.2.2.4.1. Schedule Graphic. Provide a graphic representation of the project schedule. Show all project milestones. Use absolute time designations for all dates. 1.2.2.5. Deliverables Description. List and provide a description for each planned deliverable and expected delivery dates for each deliverable. 1.2.2.6. Technology Transition and Technology Transfer Targets and Plans. Discuss plans for technology transition and transfer. Identify specific military and commercial organizations for technology transition or transfer. Specify anticipated dates for transition or transfer. conveys the key technological idea(s) | by the research. this research can revolutionize an area of | for all dates. 3.1.1. Progress Against Planned Objectives. Update the status of the specific objectives. For each objective, indicate if the objective was or was not accomplished. For each objective not accomplished, detail the current status of the objective. 3.1.2. Technical Accomplishments this Period. Describe the technical accomplishments made. 3.1.3. Improvements to Prototypes this Period. Provide a detailed, quantitative description of significant new features, capabilities and performance enhancements to hardware and software prototypes made. 3.1.4. Significant Changes to Technical Approach to Date. Identify and provide a detailed description of and rationale for significant changes to the technical approach since the start of the research project. 3.1.5. Deliverables this Period. Report the deliverables (excluding Technology Transition and Transfer covered under 3.1.6.) submitted. List the Deliverable Name, Type of Deliverable (e.g. hardware or software item, demonstration, milestone, design study or other documentation), and Date of Submission. Specify the organization that received the deliverable. 3.1.6. Technology Transition and Transfer this Period. 3.1.6.1. Technology Transition and Transfer Description. List and describe the features and performance capabilities for each technology transitioned or transferred. 3.1.6.2. Technology Transition and Transfer List. For each technology transitioned or transferred, identify the specific military, commercial, or other transition or transfer organization(s) and the application context. 3.1.6.3. Technology Transition and Transfer Contacts. For each technology transitioned or transferred, specify the, organization that received the transitioned or transferred technology. 3.1.9. Issues or Concerns. Summarize any funding, technical, programmatic, or other issues or concerns as well as recommended actions for consideration. 3.2.1. Planned Activities. Describe the planned activities. Discuss the risks and payoffs corresponding to the planned activities. Include a discussion of planned experiments, demonstrations, presentations, and technical papers. FOR RESEARCH AND DEVELOPMENT CONTRACT AWARDS WITH VARIOUS REPORTING REQUIREMENTS. Fill in appropriate name and address of contract specialist and COR in monthly and quarterly reporting clauses. Areas are marked in "Red." (2) Section I - A brief introduction covering the purpose and scope of the research effort. (3) Section II - A brief description of overall progress to date plus a separate description for each task or other logical segment of work on which effort was expended during the report period. Description shall include pertinent data and graphs in sufficient detail to explain any significant results achieved. (a) A description of current problems that may impede performance along with proposed corrective action. (b) A description of anticipated problems that have a potential to impede progress and what corrective action is planned should the problem materialize. (5) Section IV - A description of work to be performed during the next reporting period. (6) Section V - Administrative Comments (Optional) - Description of proposed site visits and participation in technical meetings, journal manuscripts in preparation, coordination with other organizations conducting related work, etc. (7) Section VI - A Gantt Chart showing actual progress versus scheduled progress. a. Quarterly reports are the most immediate and direct contact between the Principal Investigator (PI) and the Contracting Officer's Representative (COR). The reports provide the means for keeping this Command advised of developments and problems as the contract effort proceeds. The quarterly reports also provide a measure against which decisions on release of funding and on requests for supplements are made. b. In accordance with Section C., a Quarterly Report shall be submitted for each three-month period beginning with the effective date of the contract. This requirement includes all three-month periods of the contract. c. Copies of each report shall be submitted in the quantities indicated to the addresses shown below within fifteen (15) days after the end of each quarter. Internal Government distribution will be made by those offices. d. Photocopies of the blank Quarterly Report sample shown on the following page shall serve as the format. Each item of the report format shall be completed or addressed. 8. Current staff, with percent effort of each on project. 10. Comments on administrative and logistical matters. 11. Use additional page(s), as necessary, to describe scientific progress for the quarter in terms of the tasks or objectives listed in the statement of work for this contract. 12. Use additional page(s) to present a brief statement of plans or milestones for the next quarter. a. Annual reports must provide a complete summary of the research accomplishments to date with respect to the approved Statement of Work. Journal articles can be substituted for detailed descriptions of specific aspects of the research, but the original articles must be attached to the report as an appendix and appropriately referenced in the text. The importance of the report to decisions relating to continued support of the research cannot be over-emphasized. A report shall be submitted within 30 calendar days of the anniversary date of the award (a final report will be submitted upon completion of the research (last year of the award)). b. A final report summarizing the entire research effort, citing data in the annual reports and appended publications shall be submitted at the end of the award performance period. The final report will provide a complete reporting of the research findings. Journal publications can be substituted for detailed descriptions of specific aspects of the research, but an original copy of each publication must be attached as an appendix and appropriately referenced in the text. All final reports must include a bibliography of all publications and meeting abstracts and a list of personnel (not salaries) receiving pay from the research effort. Although there is no page limitation for the reports, each report shall be of sufficient length to provide a thorough description of the accomplishments with respect to the approved Statement of Work. Submission of the report in electronic format (PDF or Word file only) shall be submitted to https://ers.detrick.army.mil. FRONT COVER: A Sample front cover is provided at https://mrmc.detrick.army.mil/rrpindex.asp. The Accession Document (AD) Number should remain blank. 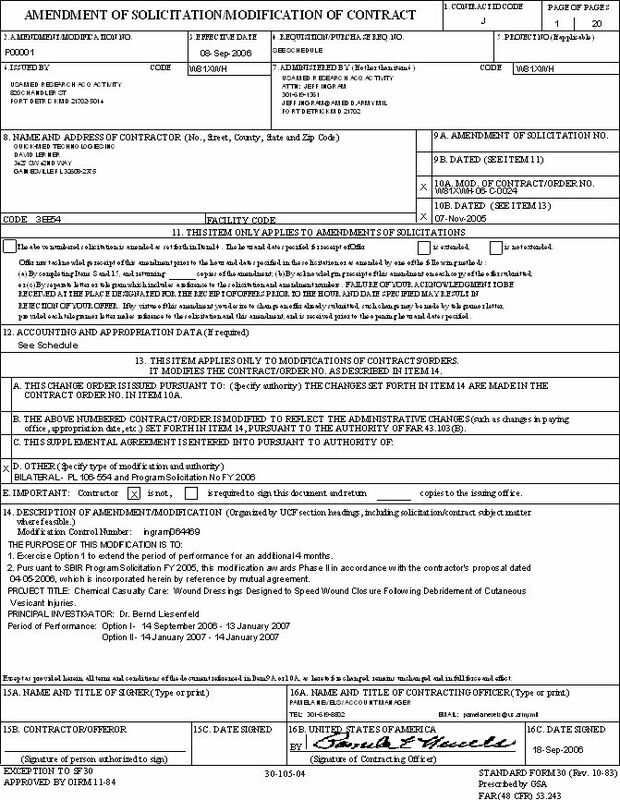 STANDARD FORM 298: A Sample SF 298 is provided at https://mrmc.detrick.army.mil/rrpindex.asp. The abstract in Block 13 must state the purpose, scope, major findings and be an up-to-date report of the progress in terms of results and significance. Subject terms are keywords that may have previously assigned to the proposal abstract or are keywords that may be significant to the research. The number of pages shall include all pages that have printed data (including the front cover, SF 298, table of contents, and all appendices). Please count pages carefully to ensure legibility and that there are no missing pages as this delays processing of reports. Page numbers should be typed: please do not hand number pages. TABLE OF CONTENTS: Sample table of contents provided at https://mrmc.detrick.army.mil/rrpindex.asp. INTRODUCTION: Narrative that briefly (one paragraph) describes the subject, purpose and scope of the research. BODY: This section of the report shall describe the research accomplishments associated with each task outlined in the approved Statement of Work. Data presentation shall be comprehensive in providing a complete record of the research findings for the period of the report. Provide data explaining the relationship of the most recent findings with that of previously reported findings. Appended publications and/or presentations may be substituted for detailed descriptions of methodology but must be referenced in the body of the report. If applicable, for each task outlined in the Statement of Work, reference appended publications and/or presentations for details of result findings and tables and/or figures. The report shall include negative as well as positive findings. Include problems in accomplishing any of the tasks. Statistical tests of significance shall be applied to all data whenever possible. Figures and graphs referenced in the text may be embedded in the text or appended. Figures and graphs can also be referenced in the text and appended to a publication. Recommended changes or future work to better address the research topic may also be included, although changes to the original Statement of Work must be approved by the Army Contracting Officer's Representative. This approval must be obtained prior to initiating any change to the original Statement of Work. KEY RESEARCH ACCOMPLISHMENTS: Bulleted list of key research accomplishments emanating from this research. CONCLUSION: Summarize the results to include the importance and/or implications of the completed research and when necessary, recommend changes on future work to better address the problem. A "so what section" which evaluates the knowledge as a scientific or medical product shall also be included in the conclusion of the report. REFERENCES: List all references pertinent to the report using a standard journal format (i.e. format used in Science, Military Medicine, etc.). APPENDICES: Attach all appendices that contain information that supplements, clarifies or supports the text. Examples include original copies of journal articles, reprints of manuscripts and abstracts, a curriculum vitae, patent applications, study questionnaires, and surveys, etc. Pages shall be consecutively numbered throughout the report. DO NOT RENUMBER PAGES IN THE APPENDICES. Mark all pages of the report which contain proprietary or unpublished data that should be protected by the U.S. Government. REPORTS NOT PROPERLY MARKED FOR LIMITATION WILL BE DISTRIBUTED AS APPROVED FOR PUBLIC RELEASE. It is the responsibility of the Principal Investigator to advise the U.S. Army Medical Research and Materiel Command when restricted limitation assigned to a document can be downgraded to Approved for Public Release. DO NOT USE THE WORD "CONFIDENTIAL" WHEN MARKING DOCUMENTS. As a result of this modification, the total funded amount for this document was increased by $315,000.00 from $70,000.00 to $385,000.00.